WHAT THEY'RE SAYING ABOUT SF CHINATOWN GHOST TOURS . . .
Voted #1 "Favorite Things To Do In San Francisco". "Best Value" Rated. "If You're Lucky, You May Just Happen Upon One Of The Many Undead Spirits Said To Be Roaming Its Dark, Narrow Streets And Passageways." "A Tour For People That Love Mystery But Aren't Afraid Of The Dark!" "Definitely More Interesting Than Your Usual Chinatown Bus Tours Loaded With Retirees." "Strongest Features Of America's Oldest Chinatown Are The Ghosts Of Its History, Exposed In A One-Woman Tour Now Running In San Francisco." "Chinatown Will Never Be The Same For Me Anymore. I Will Feel All Of The Stories." 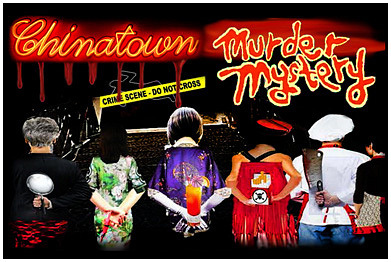 Let SF Chinatown Ghost Tours bring to life the tales of San Francisco Chinatown's supernatural past and present, as we lead you on a ghostly tour of Chinatown’s historic and mysterious streets and alleyways. The mystical folklore of this spirited San Francisco enclave will keep you on edge, as you drink in the chilling experiences of the Chinatown inhabitants of both yesterday and today. San Francisco Chinatown, the oldest Chinese community in the United States, has been a popular shopping, dining and sightseeing destination for over a century. Yet most outsiders have never experienced the extrasensory realm of vintage Chinatown after dark. Some say that specters from decades of Chinatown history emerge just after twilight. Follow along by lamplight as we journey through the neighborhood passageways where these lively spirits are said to bide their time. All the while, learn about the reverence still offered to the Goddess Kwan Yin and the hungry spirits, along with the secrets of the magic moon cake. Ancient Chinese mythology and folklore flourish to this day in the oldest and most popular Chinatown in all of North America. SF Chinatown Ghost Tours extends to you a chillingly open invitation to personally experience the unearthly side of Chinatown you never even knew existed. To learn more about our Ghost Tours Click Here.